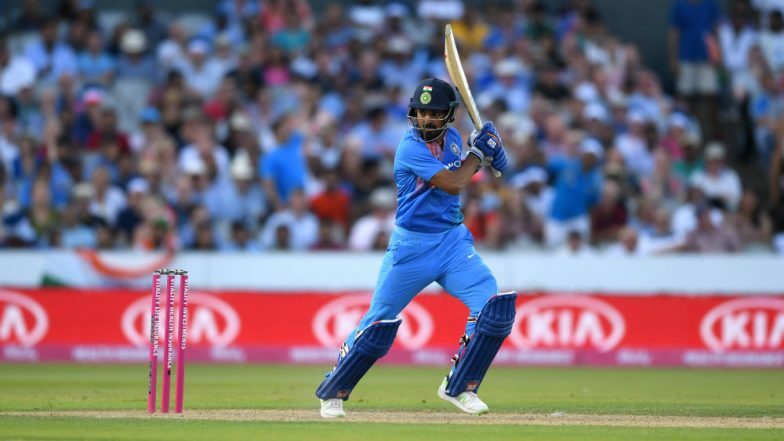 The five-member national selection committee of the Board of Control for Cricket in India (BCCI) has named the 15-man India squad for the ICC Cricket World 2019. Right-handed batsman KL Rahul has been named in the squad for the world cup, which will be led by Virat Kohli. Rohit Sharma has been retained as the vice-captain of the side. Following his impressive performance in the ongoing Indian Premier League (IPL), Rahul was expected to make it to the squad. ICC Cricket World Cup 2019 Schedule in PDF: Ticket Prices, Dates, Venue Details & Timetable Available for Download Online. Rahul was earlier this year suspended along with Hardik Pandya following the Koffee With Karan (KWK) controversy. The suspension was later revoked and Rahul was recalled in the Indian side for ODI and T20I series against Australia in February-March. However, Rahul made it to the playing XI for just one ODI and scored 26. In two T20I matches against Australia, Rahul returned with scores of 50 and 47. Meanwhile, in the IPL 2019, playing for Kings XI Punjab (KXIP), Rahul has been in good form and in eight matches has scored 335 runs, averaging 67.00. He is currently the second-highest run-getter in the IPL 2019 followed by Sunrisers Hyderabad’s David Warner. Rahul in eight outings has notched three half-centuries and one century as well.